Denise, a resident of Skibo district in Portland, displays her water-storage containers. Caption: A toilet she a flush again? Caption: She lucky she have water mi nuh have none even to flush the loo. 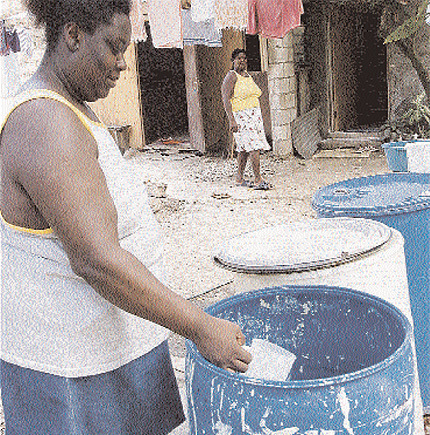 Caption: AAH thats why it is called skibo district, observe how this resident is skimming the water from the drum. Caption: di watta lack off AGAIN!!! First woman singing: every day the bucket go a well. Second woman singing: Look like a 2dey de bottom fall out. Caption: Jamaica land of wood and water.Is that not our moto, then why it is not provided for all. Caption: woman in the back ground thinking to herself: laawd jesus! watch her no, a two drum a water she drink off already with her wanga gut belly and now she a start pon the third drum. Caption: (lady in background): why ms norma keep tiefing out mi water doh eh? i caan bada with this tenement yaad style eh nuh. Caption: Ms. Denise Johnson proudly displays her home-made rum distillery in the rear of her bar in Portland. "If Wray & Nephew can mek rum, den mi must can do it too! Now all me haffi do is keep de tiefin neighbor woman Paula out a de barrel!". Seen in the background is a thirsty looking Mrs. Paula Simms. Caption: Denise: A hope she know seh who beg naw get an who nuh beg nuh want. Thank you for the 60 responses we received. Enter again and we hope you will be the outright winner next time.